Looks like you ran into a lot of great people at Book 'Em! Sorry I couldn't make it this year...enjoyed last year and meeting you! Carolyn Howard-Johnson's blurb is really good. Oh, I bet this left you so charged and inspired. What a great opportunity! Elizabeth, I really enjoyed meeting you last year! Julie, it was fun and inspiring. I have yet to meet any of the fine authors I actually know. But hopefully at some point in the future that will change. Happy Friday! Looks like a great time and thanks for the link to Carolyn's site...I'm going to check it out. Cool you got to hang out with friends! Great that you could meet all these amazing people. I know Carolyn Howard-Johnson but haven't visited her in a while. And I have yet to meet any blogger in person. Maybe one day I will. Wow, looks like a great time! Carolyn's books sound terrific. These days, writers have so many choices, it's important to learn everything we can. Lucky you, Diane! I wish I could hang out with my author friends. I haven't met any face to face, but I have gotten to speak to my CP, Angela Brown, on the phone several times. It was pretty awesome. Most of my author friends are online. It's nice you got to see yours in person. Nice photos, and everyone looks very happy to be holding their books, including you. What fun! All those awesome books, and how wonderful that you got to meet friends. 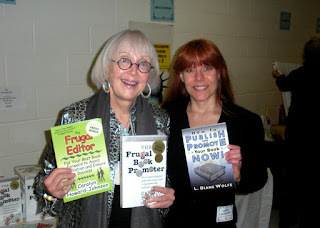 It would be wonderful to have a bloggyland book festival some year where we could all meet. :) Have a wonderful weekend! Just picked up your pub/promote book. Wished you'd pub'd it months ago. Would have saved us a lot of time if we'd read the early chapters first (and some great tips and advice there). Fortunately for us, your later chapters on networking and promoting are just in time! Looks like you had loads of fun at the conference! Mark, she posts some great tips. Mary, that would be fun. Kym and Mark, thank you so much. Hope you can at least benefit from the promoting part. Sounds like you had a wonderful time. That's great. I got to finally meet in person my online buddy Maria Zannini this month. 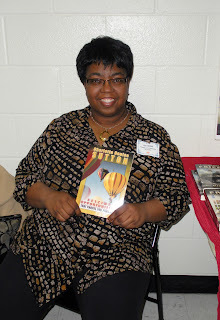 Also met author Angela Brown. We spent a few days together and had a lot of fun. I was hanging out with Kyra Lennon last night! It's so cool you get to hang out with lots of authors. Meeting up is such fun! I'm so jealous! Sounds like a wonderful event. What a wonderful opportunity... hanging out with these authors! I'm so jealous. It's been months since I had a chance to hang out with other writers. What a treat to find such a great review of Book Em, Diane. Anyone who wants to know more for next year will find it at http://bookemnc.net. p.m. terrell (no caps) makes it very easy for authors to participate. 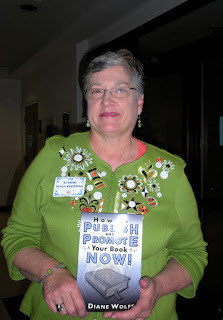 Diane, you know how much I enjoyed showing authors your new book. There are few on publishing that make the point (well enough) that marketing is an essential part of publishing. Looks like a good event for all of you. Never met any authors f2f although consider a couple very good cyber friends. I think that's really neat you got to hang out with some other authors. No doubt, an inspiring time for all concerned. Be well and enjoy the rest of your weekend. you've definitely won the book promoting author's most popular girl award!! That's awesome. I love hanging out with authors. I'll be doing that tonight. To answer your question... Way less than you, evidently!! Great pics! 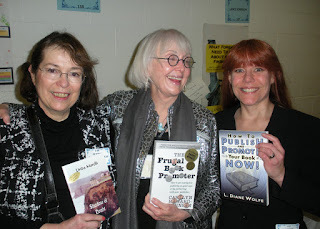 How cool to hang out with author friends at a book fair. 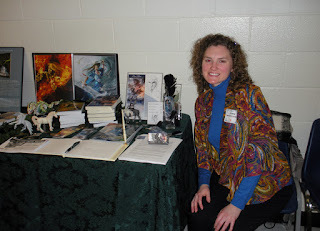 I miss going to conventions and book fairs. i haven't been able to afford to go in a while, but I'm hoping to get back into it. Carolyn, thank you so much again for all you've done! Gary, Penny is a special author. That is soooo awesome!! I love, love, love, meeting writerly folks. 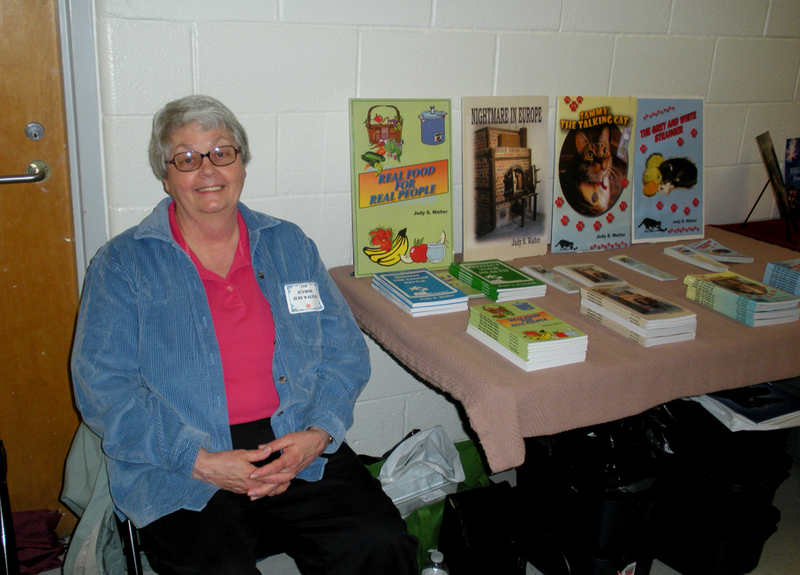 I've been meeting some local authors of late, but they haven't published much and that has been self-publishing. But I've gained some interesting insight from them. I've been particularly inspired of late by 90 year old Jack Eiden who has two massive novels near completion. The guy's enthusiasm, sense of organization, and quest to learn new things has impressed me. I've convinced him to start a blog and he is diving into the effort with great excitement about the future. Thanks alot, Diane. I look like I've been on a three-day drunk. Sounds like you had a great time and made/met some great connections! Sorry I'm so late to the party.... What a great time you all had!